This paper is the final report of a research project whose aim was to analyse the methodology of calculating the costs and benefits for the Czech Republic, Hungary, Poland and Slovenia of the envisaged accession to the European Union. The research focused particularly on the impact of the emerging EMU and on the application of the CAP, Structural Funds and the customs union. 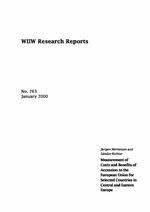 The paper reviews, compares and evaluates the techniques/models used and the results arrived at in the individual countries in the assessment of the costs and benefits of EU accession. The main lesson from our research project is that no single methodology can be distinguished or developed as 'the' solution to the problem of measuring the costs and benefits of accession to the EU. The degree of uncertainty in all important aspects of the EU's eastern enlargement is high and the constraints in the application of model-based methodologies are such that robust assessments of accession-related costs and benefits are extremely difficult to produce. Nevertheless, due to the political and economic need for a proper perception of the implications of membership, research on costs and benefits must be implemented, even if under suboptimal conditions and with rather limited validity of results.